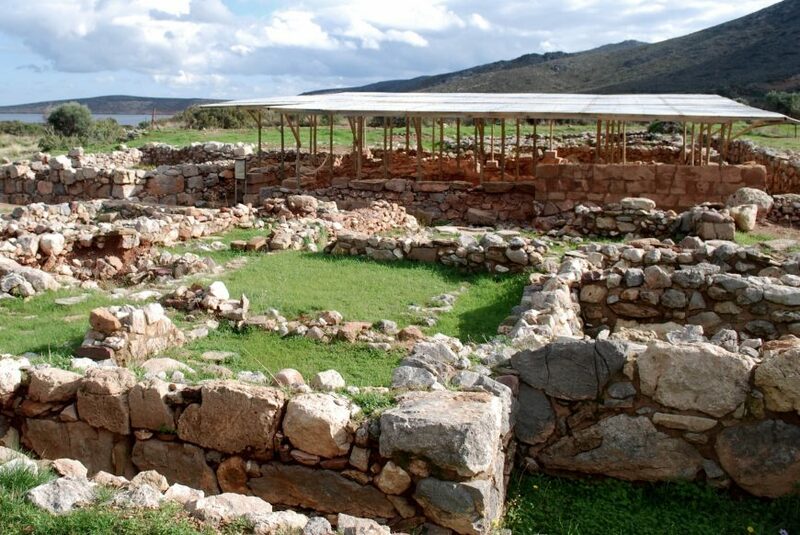 The style was imitated by potters on the Greek mainland as well as the islands of Melos. 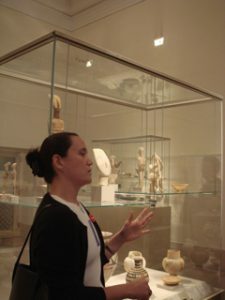 One of the most important aspects of Minoan culture was its ceramics. Pottery today may not seem particularly interesting or important, but in the second millennium B.C.E., it was a high art form and its manufacture was often closely associated with centers of power. 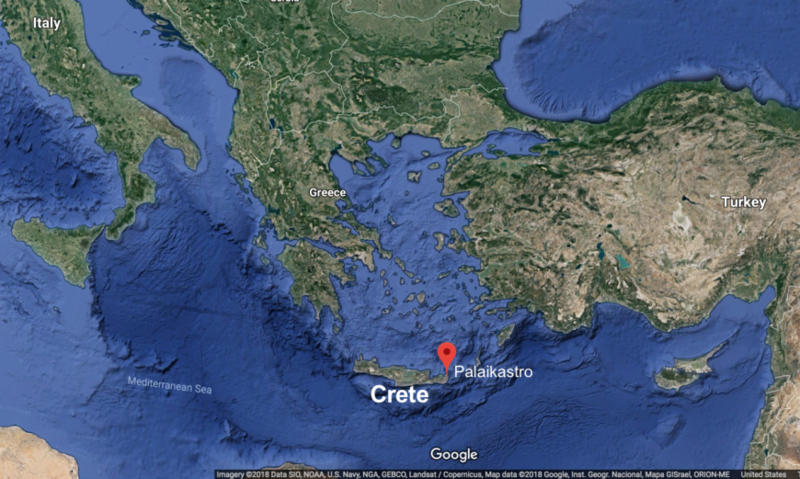 Much like the production of porcelain for European royal houses in the 18th century, the production of pottery on Crete tells us about elite tastes, how the powerful met and shared meals, and with whom they traded. 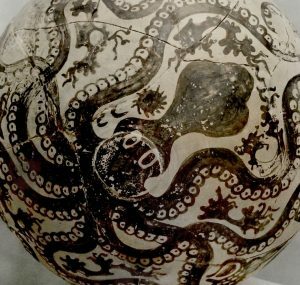 This vase, found at Palaikastro, a wealthy site on the far eastern coast of Crete, is the perfect example of elite Minoan ceramic manufacture. It is 27 cm (about 10.5 inches) high, wheel-made, hand-painted, and meant to hold a valuable liquid—perhaps oil of some kind. Its shape is somewhat unusual, constructed by slipping together, while still leather hard (clay that is not quite dry), two shallow plates which had been made on a fast spinning potter’s wheel and with highly refined clay. The circular bases of these shallow plates are still visible in the center of both sides of the flask. A spout and stirrup-style handles (which would allow the user to carefully control the flow of the liquid out of the container) were added by hand, as well as a base, to facilitate the standing upright of the vessel. Lastly, the Marine Style decoration would have been added. 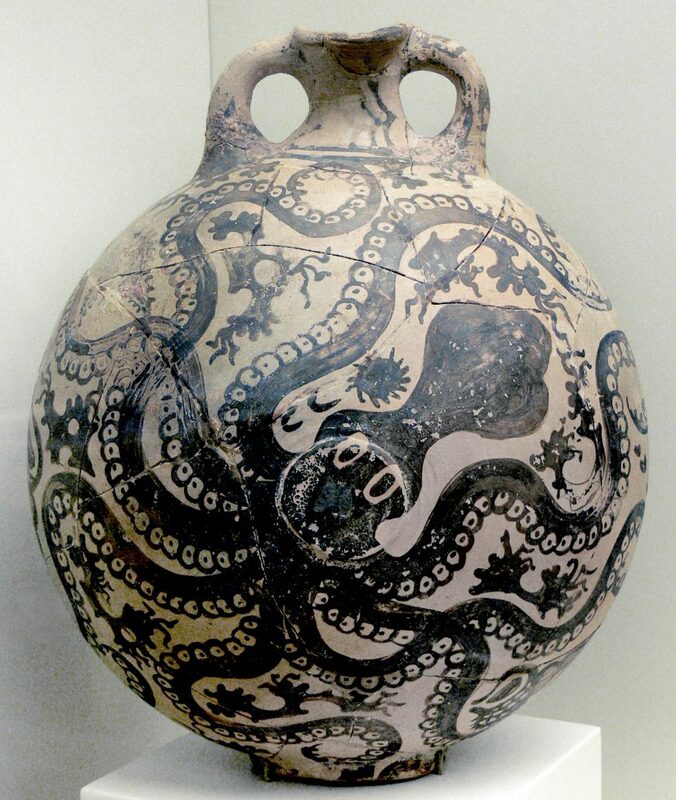 Using dark slip on the surface of the clay, the Minoan painter of this vessel filled the center with a charming octopus, swimming diagonally, with tentacles extended out to the full perimeter of the flask and wide eyes that stare out at the viewer with an almost cartoon-like friendliness. Around this creature’s limbs we find sea urchins, coral, and triton shells; no empty space is left unfilled, lending a sense of writhing energy to the overall composition. Marine-Style pottery, of which this vessel is a prime example, is regarded as the pinnacle of Minoan palatial pottery production, specifically of the LM I period (around 1400 B.C.E.). 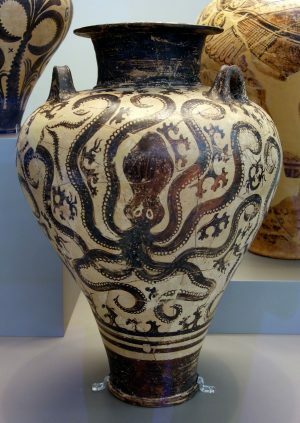 Those who believe “hands” (that is, specific artists) can be identified in the painting of Bronze Age pottery have identified this vessel as the work of the Marine Style Master, who worked at the site of Palaikastro. The era of Marine Style pottery coincided with a period during which the Minoans’ trade networks spanned widely across the Mediterranean, from Crete to Cyprus, the Levant, mainland Greece, and Egypt. 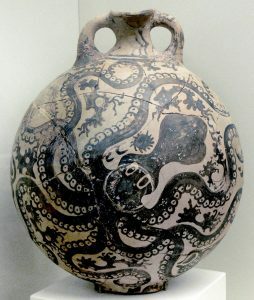 Some have connected this seafaring skill to the popularity of Marine Style pottery. 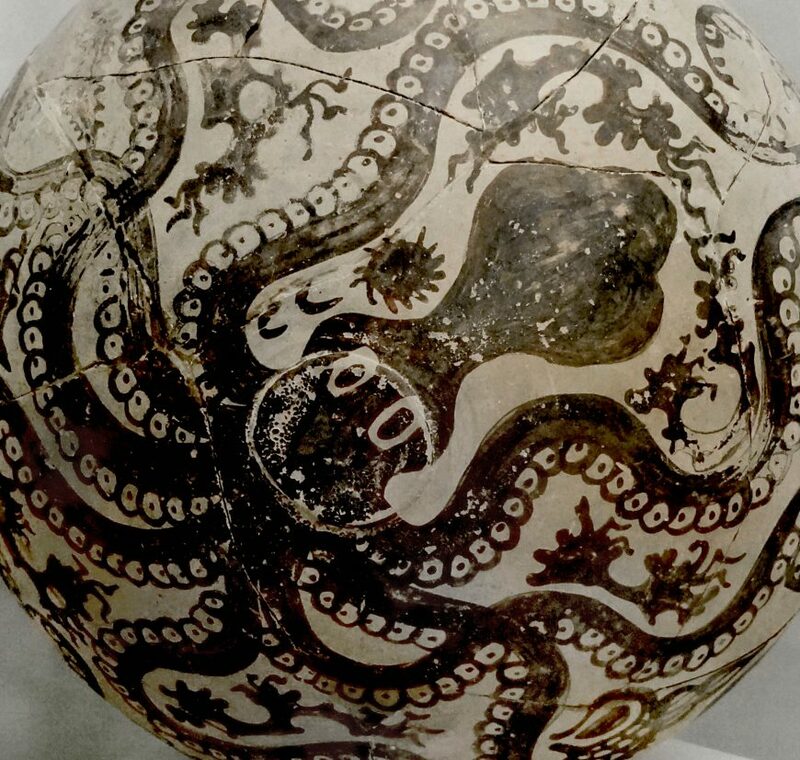 The style was imitated by potters on the Greek mainland as well as the islands of Melos, and Aegina, but none could match the charm and grace of the Minoan inventors of the style. This entry was posted in Ancient, Art History, History, Minoa. Bookmark the permalink.